When my discount broker Scotia iTrade finally added registered US accounts to their repertoire of offerings, I looked to see which of my stocks I could/should move over the US side of my RRIFs and TFSAs. The goal was to receive US cash directly from the companies that paid US dividends without incurring any currency conversion fees. This would apply for stock of companies based on US stock exchanges such as NYSE, as well as for Canadian companies listed on the TSX who happened to pay their dividends in US currency. This would be a great way to accumulate US cash for spending purposes without paying currency exchange rates. Multiple sources on the internet including a Globe and Mail Investor column, MyOwnAdvisor.ca, CanadianCapitalist.com and DividendEarner.com have listed Canadian companies who pay their dividends in US currency. I happened to own several of them including two Brookfield Asset Management listings (BIP.UN and BEP.UN) and Algonquin Power (AQN.T). Accordingly I requested my discount broker to move the shares of these stocks to the US side of my accounts, thinking that I was saving money on currency conversion. As it turns out, this was only partially correct. Algonquin Power does actually pay its dividends in US dollars and each quarter, I have been receiving the exact amount of US cash that I expected to, based on their posted rate multiplied by the number of shares that I held. As it turns out, this is NOT the case for Brookfield. Just recently, one of my blog readers kindly pointed out to me that people who had moved their Brookfield shares to the US side of their account were complaining that they were actually losing money! This is because the declared "US dividends" were actually being converted to Canadian when paid to the discount brokers, who then convert them back to US in order to allocate to the US side of their accounts. In all, they were losing 2.5+ percent per transaction! I guess I should have verified this myself when I made the switch, but who knew that so many sources could be wrong? This seemed very confusing to me, so I set out to investigate. First I confirmed that the assertion was true by finding the latest published quarterly yield for my stock which I then multiplied by the number of shares that I held. For example, I have 353 shares of BEP.UN in the US side of my TFSA account and the rate of payout for March was USD 0.515. Accordingly I expected to be paid $181.80 USD. Instead I was only paid $176.82 with the difference being attributed to conversion fees. The net difference was even larger in my husband's RRIF account where he held significantly more shares of BIP.UN. Next I wanted to understand why this was happening and where the double conversion was taking place. I looked on the Brookfield Dividend Page and found this disclaimer at the bottom. The first sentence is what probably led to the widespread misunderstanding. Please note that the quarterly dividend payable on Brookfield's Class A Limited Voting Shares is declared in U.S. dollars. Registered shareholders who are U.S. residents receive their dividends in U.S. dollars, unless they request the Cdn. dollar equivalent. Registered shareholders who are Canadian residents receive their dividends in the Cdn. dollar equivalent, unless they request to receive dividends in U.S. dollars. I phoned Scotia iTrade to find out whether it would be possible for me to request Brookfield to pay my dividends in US dollars. What I was told was that Brookfield was not paying me (or any other investor directly). They were paying the discount broker, which is a Canadian corporation and therefore the payouts from Brookfield are in Canadian dollars. So it makes absolutely no sense for me to hold these stocks in the US side of my account, incurring a conversion fee each time a dividend is paid. I asked iTrade to move my Brookfield stock back to the Canadian side of my account, but I worry about all the misinformation that is still out there about Brookfield. I will try to contact some of these websites to make them aware of the situation and ask that Brookfield be removed from the list of "Canadian companies paying US dividends", or at least clarify that they do not pay this to Canadians! On the other hand, Algonquin Power does pay its dividends in US dollars regardless of whether they are paying a Canadian or American resident. I will now count on it to generate US cash dividends that I can use to spend. For provinces including Ontario, Saskatchewan, Manitoba and New Brunswick who chose not to implement their own carbon tax plans, the Federal government intends to levy its own taxes on fuel purchased in those locales. To offset the impact of this, the 2018 CRA tax form has included a Climate Action Incentive, which gives Canadians in these provinces a tax deduction which directly reduces the amount of income tax owed. There seem to be no income claw-back implications so each household is eligible to receive some amount, depending on the family size. An extra amount is provided for small or rural communities. Note that only one taxpayer can claim this incentive on behalf of the household and it probably makes sense for the one with the higher income to do so. The incentive is supposed to be revenue neutral for the Federal government and compensates for the impending higher fuel charges. This is meant as an appeasement to those against a carbon tax, and the incentive has been offered in advance of that tax being applied. However so far, there has not been much publicity highlighting this incentive, and even less information about how you actually go about claiming it on your tax form. As an appeasement tactic for the Federal government, not touting this far and wide seems counterproductive? After some searching on the internet, my husband and I found that you need to fill out Schedule 14 and the resultant deduction will appear on Line 449 of the Credits section (page 4) of your income tax form. I chose to apply the deduction to my taxes. For years now, we have used the free income tax program StudioTax in order to enter our tax information and to NETFILE. Once we figured out which schedule to fill out, it was a simple matter of finding that form on StudioTax and filling out the few fields relevant to us. The program automatically applied the applicable deduction to line 449 and the amount of my taxes owed was reduced accordingly. I assume that anyone filling out a paper form would need to fill out Schedule 14 as well as enter the result in line 449. It has been 6.5 years since my husband Rich and I retired together at age 48 and the time seems to have gone by in a flash. Reflecting on this past year, 2018 certainly was a wild and turbulent time for the stock market. The S&P/TSX Composite Index went through a roller coaster ride, starting off at a 10-year high with a value of just under 16413. 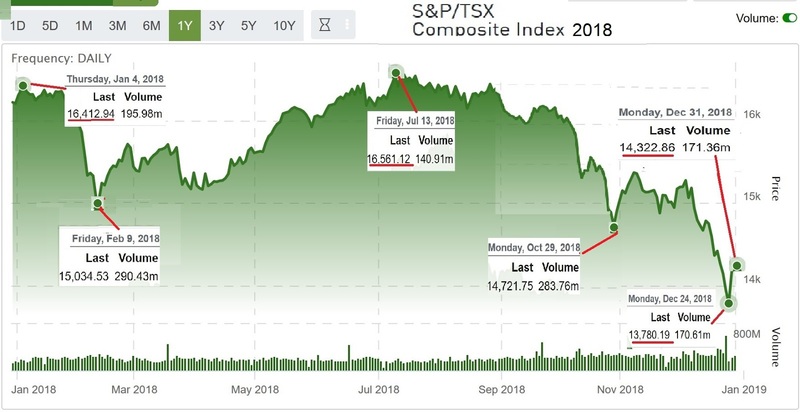 After such a long bull run and with all the economic and social-political turmoil happening around the world, it is not surprising that the markets were due for a fall. By the second week of February, the index fell 8% to 15034 but surprisingly by mid July, it had rallied to be even slightly higher than its year-beginning value. Unfortunately it was pretty much downhill from there, as the index went on a downward spiral, falling to its lowest point on Christmas Eve with an index of 13780. The index was16% below its starting value before rallying slightly and closing the year with a final value of almost 14323, down 12.7%. It is too bad there is not a way to predict the timing of the rise and fall of the stock market, in order to take advantage of the adage to buy low and sell high. 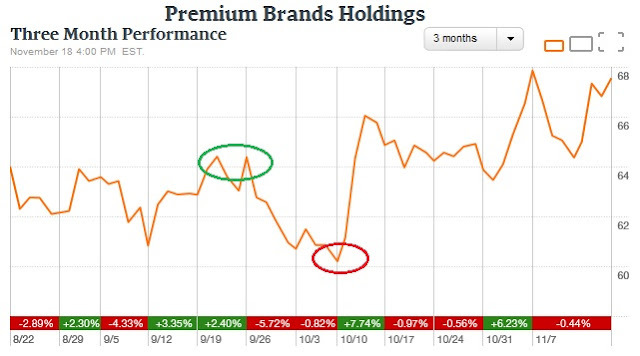 In early February, as part of an effort to re-balance our portfolio, I decided to sell some of the shares of Premium Brand (PBH) in my LIRA for $106/share. This would reduce the total value of that holding and lock in some of the profits made. The shares had risen rapidly in price since I first bought them in October 2016 for $60/share. I regretted the sale when the stock price continued to rise to over $120 through April, but then unexpectedly, the price started to plummet. By the end of 2018, PBH was going for around $75/share and my earlier transaction seemed prescient, when it was actually just dumb luck. Our portfolio followed a similar trend to the TSX and ended the year down 10% from our opening balance. But because of our strategy to hold Canadian eligible dividend paying stocks long-term while living off our dividends, we were not really affected by the volatility. While the value of our portfolio took a dive along with the rest of the market, the total dividends generated by our stocks increased by 5%, with the majority of the companies that we hold raising their payout at least once in the year. Since we first started living off our dividends when we retired in 2012, our total payout has increased over 45% despite a few duds decreasing or eliminating their dividends. When the market eventually recovers, I will look at the feasibility of selling the few stocks that we own which have not raised their dividends for multiple years. This is assuming that I can find replacements that have a better history of raising dividends, but which will still maintain our diversification and dividend yield requirements. We actually see the downturn in the markets as an advantage since it allows us to use the Dividend Reinvestment Plan (DRIP) to purchase more shares at a lower price. We apply the DRIP to companies that we would like to grow, in accounts where we are not using the dividends paid as immediate income. As part of our annual year-end review, I took a look at the distribution of our various stock holdings and the dividends that they generate in terms of market capitalization and market sectors. We want to ensure that our holdings are skewed more towards the stability of large and mid cap stocks as opposed to small cap, and that we are well diversified across multiple sectors. This year, our small cap percentage increased, not so much because we bought more stock from smaller companies, but because some of our mid cap stocks lost so much in value that they became small cap. Despite our goal to buy and hold most of our stock, 2018 marked an unusually active trading year where we lost our holdings in some companies through forced buy-backs, mergers and acquisitions. In some cases, it was a welcome and beneficial change while in others, it was not what we would have preferred to have happened since it led to a loss of a steady dividend income stream that we would now need to find a replacement for. The CEO of HNZ Group bought back all of the shares of his company at a price of $18.70/share, which left us with a capital loss of around $7K but gave us a much higher share price than the market price. Enbridge (ENB) merged with its subsidiary Enbridge Income Fund (ENF), providing Enbridge shares to replace the ENF shares. Royal Bank (RY) called back its preferred shares RY.PR.D and paid out its value in cash. This was actually a blessing for us since we regretted buying the preferred shares but there was not much of a market to sell them. The preferred shares gave us a good yield of 4.5% at the time of purchase and promised a more stable share price. But the dividend was fixed while Royal Bank raised its yield twice annually over the same period. We would have been better off to just buy and hold more Royal Bank. In each case where we received cash for the buybacks, we purchased more dividend paying stock. I chose Emera (EMA) and Bank of Montreal (BMO), both with long-standing histories of raising dividends. An interesting situation arose when it was announced that Brookfield Infrastructure (BIP.UN) would purchase Enercare Inc. (ECI) in a friendly takeover. We own both of these stocks, holding Enercare in both a registered and a non-registered account and Brookfield only in a registered account. Our first decision was whether to accept cash or Brookfield shares for the transaction. While I would want more BIP.UN in my registered account, I do not want it in our non-registered account because it is a limited partnership that pays return of capital instead of dividends, which leads to accounting and tax complications if not sheltered in a registered account. By the time I made my decision to take shares in the registered account, it was too late to make the request, so I ended up with cash in both cases. The next issue to deal with was the $18,000 capital gain that would be triggered in our non-registered account from this forced "sale" of our ECI stock. We already had a $7K loss from the HNZ transaction to partially offset the gain, but still needed a further loss of $11K to offset the whole amount. At the beginning of the year, we assessed the major "paper loss" that we held in our Corus (CJR.B) stock when its price plummeted to less than 20% of our purchase price. We decided that since we would lose so much of our initial investment, it was not worth selling even though they planned to cut their dividend later in the year. We would not recover enough money to buy much of anything else so our best bet was to hold, gather the measly remaining dividends and hope for an eventual rebound or a buyout like HNZ which might artificially inflate the sale price. But now that I needed a loss to cover the ECI gain, it seemed the perfect time to dump some of my Corus stock, which I did. Like Corus, I had a similar decision to make with my Cominar REIT (CUF.UN) stock, which I held in my RRIF account. After years of paying out a fairly decent dividend, Cominar cut their dividend slightly in 2017 and then more significantly in 2018. I should have cut and run last year but inertia and the hope of recovery prevailed. Now belatedly, it was time to take action and unlike Corus, I would still recover over 67% of my initial investment which was enough to buy a replacement stock. With the cash generated from the sale, I purchased Manulife Financial (MFC) which yields a healthy 5% and has raised its dividend annually for at least the past 5 years. In last year's blog, I wrote about changing our RRIF withdrawal strategy from taking a monthly cash payout to making a stock withdrawal "in-kind" at the beginning of the year. The goal is to gradually move dividend income from being taxed at 100% in the RRIF to generating Canadian eligible dividend income in our non-registered account which is taxed at a much more lenient rate. We would also be reducing the values of our RRIFs at a faster rate since we are removing both the capital and the income it generated. Finally by taking our RRIF payments as stock in kind, it reduced the amount of cash that we needed to save up in those accounts, and therefore allowed us to DRIP some of our stocks. My second goal was to smooth out the monthly dividend income being generated from our non-registered account so that each month would pay enough to cover regular expenses. Abnormal or unexpected expenses would require dipping into the cash reserves that we held in our short and long-term "kitties". Since the dividends paid out in the second month of each quarter were relatively meager, I deliberately withdrew stock from our RRIF accounts that paid out in that month. While I made good inroads last year, I am happy to report that at the end of 2018, this second goal has been fully accomplished. For 2019, I no longer need to worry about this requirement when selecting which stocks we withdraw for our annual RRIF payments. In late 2018, I turned 55 which is a milestone year in terms of our retirement, expense and investing strategies. I now qualify for a few early seniors discounts including 20% off on Tuesdays at Rexall Pharmacy and 10% off at Best Western. While the medical emergency travel insurance that I usually purchase from Manulife costs a few dollars more after turning 55, at least I still don't need to fill out a medical questionnaire to qualify. This is not required until age 60. I also confirmed that I still qualify for the 15 day travel insurance that comes with our Visa infinite Dividend credit card. This ends at age 65. Most significantly, turning 55 meant I could finally start collecting income from my locked-in defined contribution work pension plan, which I moved into a self-directed locked-in retirement account (LIRA) at the time of my retirement at age 48. While we were able to convert our RRSPs into RRIFs immediately after retiring and have been receiving annual income from these accounts ever since, our LIRAs were not available for conversion into Life Income Funds (LIFs) until age 55. In addition to the age requirement, the LIF is much more restrictive than a RRIF in that you are required to withdraw an annual amount that falls between both a minimum and a maximum. The limit on how much you can withdraw each year is designed so that the income in the LIF lasts until age 90. These paternalistic controls on my hard-earned employment retirement savings felt galling to me, so I was happy to learn about a relatively obscure rule that allows me to request that 50% of my LIF be freed either as cash or as a one time tax-free deposit into my RRIF account. The catch is that you must submit the form within 60 days of the LIF account becoming active, or else you lose this right forever after!! Information about this rule can be found on the Financial Services Commission of Ontario website and the request form can be found at https://www.fsco.gov.on.ca/en/pensions/Forms/Documents/C-1204E.2.pdf. On the day of my birthday, I called the sales department of my discount broker Scotia iTrade in order to open a locked-in Life Income Fund (LIF). They were able to fill in most of the form for me over the phone and then emailed it to me to print and sign. I dropped off the signed form at my local Scotiabank branch and within a few days, my LIF account was open. I then proceeded to wait and wait for the money to be transferred from my LIRA to my LIF. What I was not informed until I enquired a week later was that I had to send them a written "letter of instruction" before this would happen. It was not automatic as I initially assumed and this delay almost derailed my timing for processing the form to free 50% of my LIF. In the meantime, I scheduled an in-person meeting with a representative at the Scotia iTrade sales office in order to execute the directive to free the 50% of the LIF. I chose to move the money into my RRIF as opposed to taking a lump sum cash amount, in order to prevent a major tax hit on my 2018 taxable income. This way, I will be taxed on the LIF withdrawal but will be assigned a deduction for the same amount, resulting in no tax being paid on the transfer. I printed off the form and filled out most of the fields prior to the meeting. Part III and Part IV of the form required signatures in front of an impartial witness, which the iTrade sales rep was able to act as. I found out from a friend who had a federally regulated pension plan that he required a Public Notary or Commissioner to be the witness. Luckily this was not the case for my provincially regulated LIF. Noting that Part IV required signed approval from my spouse, I brought my husband with me to the meeting so that he could sign in front of the witness. I requested to transfer 50% of the value of my LIF into my RRIF as stock in kind. Prior to the meeting, I spent some time analyzing the stock in my LIF to see which companies and how many shares I could move in order to come close to 50% of the value of the LIF. Because I could not predict the stock prices on the day of the transfer, I requested a bit less than the 50% value and made sure that I had accumulated enough cash to make up the difference. I instructed the rep to use the lowest stock price of the day, so that I could free up more shares. As of this year (2019), I will need to start my annual withdrawal from my LIF and will again request to withdraw stock in-kind. At age 55, my minimum withdrawal is 2.86% and the maximum is 6.5%. Unlike the RRIF, I cannot use my spouse's age to set the withdrawal percentages. Now that I have gone the entire process of converting my LIRA to a LIF and freeing 50%, my husband will be ready to do the same when he turns 55 later this year. Since his work pension amount is less, after the 50% withdrawal he may soon qualify to unlock the entire remaining value of the LIF under the "Small Amount" rule. See Question 9 of the LIF FAQs. Several years after RBC and TD Banks first introduced them, my discount broker Scotia iTrade has finally followed suit and now offers U.S. registered accounts for RRSPs, RRIFs, LIRAs, LIFs and TFSAs. Within these accounts, you can hold American stocks or Canadian stocks such as Algonquin Power (AQN.T) and Brookfield (e.g. BIP.UN, BEP.UN) that pay dividends in U.S. Dollars and keep the U.S. cash rather than having the dividends converted to Canadian and incurring currency exchange and extra fees charged by the brokerage. It has been estimated that the savings on these fees could amount to as much as 1.5% of the value of the dividends for each payout. I have now moved the applicable stocks in our portfolio to the US side in both our registered and non-registered accounts. For our non-registered account, I have been transferring any US cash dividends to my US bank account, thus generating a source of US funds to spend on our trips to the United States without having to pay currency conversion rates. I am not sure yet whether I can withdraw US cash from the US side of my TFSA account directly to the US side of my non-registered account without the money being converted to/from Canadian. If this is possible, then I assume that I can then re-contribute the Canadian value of that withdrawal amount the next calendar year? I will try this with a small amount later on in the year. Similarly I have not tried to withdraw US stocks in kind as part of my annual RRIF withdrawal. This might be an experiment for a future year. In 2018, we made some major changes to our utility expenses. Finally deciding to get with the times, we purchased a second cell phone so that we each had one and cancelled our phone land line. In addition to the cost savings of the phone line, we had the extra intangible advantage of getting rid of the telemarketers and donation seekers who were basically the only ones calling our land line. We now obsessively protect our cell phone numbers and only provide them to companies or institutions that we actually want or need to call us. We were lucky enough to be able to take advantage of the brief price war that the major Tel-coms waged this year and snagged the deal of 10GB of data for $60/month from Bell Canada. In fact, my husband signed up for the cell service deal before we even bought the second phone. We renegotiated a cheaper price with Rogers for our internet and cable bill after our previous discounted deal expired but it was only for one year so I think we will need to try and do so again this year. For the first time since 2014, we were not able to secure a home swap for our vacation. We still had a lovely 3 week "Off The Beaten Path" trip to London, England in May, but it was quite the sticker-shock when we had to pay for our own accommodations for the first time in years. We also took an overnight cycling vacation to Meaford, Ontario (near Collingwood) in July and an impromptu, last-minute 2 night/3 days stay in Manhattan in November which I am busy trying to blog about. Unfortunately once again, I have not been able to finish writing about our vacations within the year that we took them. We continue to enjoy tennis, cycling, walking, theatre, art galleries and taking interest courses. I have been trying to complete a free online course on Greek Mythology for over half a year now, but keep getting distracted by other activities and social events. Our early retirement continues to be wonderful, active, fulfilling, stress-free and was worth all the saving and planning over the years that made it possible. This coming May 2017, it will be five full years since my husband Rich and I simultaneously retired at age 48. They say that time flies when you are having fun and that has certainly been true for us. We have had a blast in the past 4.5 years (other than during my brief period recovering from health issues) and we have never encountered a dull moment when we felt bored or wondered what we could do next. In fact, we have been so busy that we need to prioritize our interests. We have settled into a routine where our fall and winter days are filled with indoor tennis, interest courses at U of T's Innis College, attending live theatre including our annual subscription to Mirvish Productions, trips to the Art Gallery of Ontario and other museums, as well as visiting or entertaining friends and family. We are so busy during this period that we don't have time to travel, which works out fine for us since we are not keen on "sun vacations". Instead, we have been taking 4-7 weeks of vacation each year during the spring and summer, continuing to take advantage of the financial and cultural perks of home swapping. 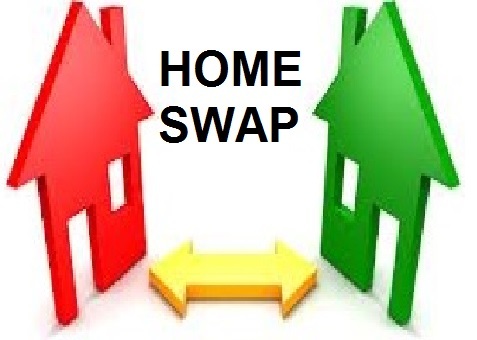 Each year I think that we may not find a new swap opportunity, when out of the blue, another great offer arises. Since retiring, we have traveled via home swap to the South of France, all around Ireland, Amsterdam, Venice and Paris. This coming spring, we will be doing a two week swap in Antwerp, Belgium with side trips to Bruges, Ghent and Brussels. So from an emotional and social perspective, we have no regrets regarding our early retirement and cannot conceive of ever wanting to work again. We are just having too much fun enjoying our freedom and the luxury of time! Now for a review of how we are doing financially, to ensure that we will not be "forced economically" to go rejoin the workforce in the future. 2015 was a tough year for the TSX, which lost 11% of its value relative to the previous year. The value of our portfolio after dividend payouts ended the year at just about the same amount as the start of the year, which meant that excluding dividends, our portfolio was down just over 2%. This was actually a good result for us when compared to the performance of the market as a whole. More importantly, in spite of the across-the-board hit to stock prices, the total dividends paid from our stocks still increased by 8%. Since our retirement income strategy (as described in our book Retired at 48 - One Couple's Journey to a Pensionless Retirement) relies primarily on these dividends, in effect, we received a pay raise in 2015 despite the poor year. By contrast, 2016 was a tremendous year for the TSX, resulting in a gain of over 22% from the previous year. Our portfolio matched this performance almost exactly, up 24.5% including dividends and 21.66% after removing our dividends for income. Just as we were not too concerned with the decline in value of our stocks in 2015, we are not overly excited in what might be a transient increase in 2016. As always, our focus is on the dividends which once again increased by 8% relative to the previous year. There are signs of concern though since for the first time since we started investing in equities, two of our stocks (Husky Energy/HSE.T and HNZ Group/HSZ.T) actually eliminated their dividend causing their share prices to plummet, while two other stocks (Enbridge Income Fund/ENF.T and Corus Entertainment/CJR.B) failed to raise their dividend for the first time in over 5 years. Is this a harbinger for a slow-down in the rate of dividend growth in Canadian stocks for the coming year(s?). That would fall in line with the forecasts from multiple US market sources throughout 2016 regarding dividend growth slow-down in US stocks due to a corresponding slow-down in earnings. Luckily our dividends have risen 34% since our retirement in 2012, so we are far enough ahead of the game to be able to withstand even an extended period of slower growth. It is interesting to note that the dividends did better in the bad TSX growth year in 2015 than the good one in 2016. Perhaps there is a time delay in reaction to the previous year's results? While we withdraw just about all of the dividends from our non-registered account to use as income, we only withdraw the legislated minimum from our RRIFs. Until we reach age 71, the minimum is calculated by the formula (1 / 90-age in current year) * Balance of RRIF on Dec 31 of previous year. The government's intent is for the dollar amount of the minimum RRIF withdrawal to increase each year to provide an income amount that accounts for inflation. This did not happen in 2016, since our 2015 ending RRIF values were actually lower than the previous year. As a result, my RRIF minimum in 2016 was $28 less than 2015! This situation has reversed itself with the huge stock value gains of 2016, resulting in my 2017 RRIF minimum increasing by 14% over the previous year. For the most part, our discretionary expenses (entertainment, travel, dining) came in around the same levels as last year. On the other hand, mandatory expenses climbed higher than the rate of inflation with electricity costs rising 23%, condo fees up 4%, and groceries up 9%. But all that was a drop in the bucket compared to the huge, one-time unexpected expense that we learned about last year—this was the need to replace defective Kitec pipes in our condo. While we had over 6 months warning to save up some money, the $13,000+ final bill still put a dent in our long-term emergency kitty fund. We will need to slowly rebuild this kitty in 2017 and hope that no new major unexpected expenses arise this year. So far since our retirement, we have been able to live off of our annual dividends plus our emergency cash funds without requiring to dip into our capital. Having a healthy emergency kitty helps us prolong this goal. All along, we have been monitoring the distributed value of our equities portfolio in terms of market capitalization and diversification of business sectors as a means of reducing risk. Our goal was to not have too large a percentage of our holdings in any one sector, or in small-cap companies. With this year's annual review, we have started keeping track of the same distributions in terms our dividends. We wanted to make sure that our dividends are not stacked towards one sector such as oil and gas, where the industry as a whole might go through a rough patch, increasing the potential of companies lowering or stopping their dividend payouts. We are fairly satisfied with the results of this exercise as we saw that most of our dividends come from large and mid cap companies and are reasonably spread out across the sectors. Our percentage of small-cap holdings have shrunk over the past year, as several former small-cap companies have grown to the point where they are now categorized as mid-cap. For this year's review, I finally hunkered down and did the calculations to determine the answer to a question that I have been wondering about since we retired. It relates to when to start taking our CPP payments. The government has put a heavy penalty of 6% per year for taking CPP earlier than age 65. But the calculation of my annual CPP retirement benefit is also impacted by the number of years where I did not max out on CPP contributions, between age 18 and the year I start taking CPP. Obviously once I retired at age 48, I stopped making any CPP contributions since I no longer generated any earned income. So what would hurt me more, my growing number of years of zero CPP contribution or the penalty for taking CPP early? If I took my CPP at age 60, I would save myself 5 additional zero years, but would this be worth it to offset the penalty of starting CPP early? It is a long, convoluted calculation to determine what my CPP retirement benefits would be if I started taking them at age 60 vs 65 vs 70. I followed the instructions of this Retire Happy Blog which walked me through the steps, creating a new spreadsheet (I love spreadsheets!) to guide me. I'm not sure I have all the details exactly correct, but I completed enough of the the exercise to answer my question. Although I would definitely receive less than the maximum possible CPP benefits due to my 17 extra years of retiring early and not contributing, I was still better off waiting until age 65 or later to take CPP, assuming I don't need the money earlier. The impact of my elevated number of years of zero CPP contributions became inconsequential relative to the massive penalty of taking CPP early. This is what I always suspected the results would be, but it was definitely interesting to definitively prove it. Comparing our 2016 year end total against our original retirement plan, we continue to trend significantly ahead of plan and are well positioned to live out our retirement years without running out of money. Thank goodness, since I have no intention of ever going back to work. That would be no fun at all! Stock investors as a whole are a curious group. There is the general tendency for investors to panic with each financial, economic, or socio-political event that causes uncertainty either nationally or internationally, resulting in a temporary drop in stock prices. Sometimes even just the anticipation of a situation can trigger a sell-off. Be it the falling price of oil, the American fiscal cliff, the threat of Grexit, the economic slowdown in China, or the vote for Brexit, news of each of these events have induced an adverse reaction from the stock market. Often an across-the-board dip does not last more than a few days and sometimes recovery happens even within the same stock trading day. There seems to be no shortage of candidates for the next crisis including the long-term fallout from the Trump presidential win in November, the upcoming Italian referendum on Senate reform in December and the proposed Brexit trigger of Article 50 in March. With so many potential opportunities to pick up stocks on a temporary decline, it is a good time to build up excess cash in order to take advantage of the next mini-dip. Unfortunately since we are retired and only earn income through our investment portfolio, there is limited opportunity for us to accumulate cash. Our options are either to save up excess dividends or to sell stock shares in order to general a cash pool. With this in mind, a while ago I decided to stop reinvesting my excess stock dividends via the Dividend Reinvestment Program (DRIP). I also sold the shares of a stock in a registered account that hadn't increased much in value since purchase and didn't regularly increase its dividend. This provided me with a modest sum of cash to play with. Yet predicting exactly when the next stock dip will occur is not as easy as it sounds, given that we are not monitoring the stock market every day, let alone every hour of each day. As well, stock prices do not always react as expected. After Donald Trump won the US Presidential election, we expected a fire sale in the worldwide stock markets. A temporary panic did occur overseas while the North American markets were closed, but stock prices rallied and even rose by the time the Canadian and US markets opened. It was not until several days later that the TSX experienced a mini decline. In order not to totally miss the chance to "buy low" on the next stock decline, my husband and I use the following strategy when we have some extra cash to invest. First we decide which stocks we might be interested in buying, using target price, analyst recommendations, and other factors to guide us. In many cases, we look to just add more shares to stocks we already hold. Next we guess at a "low" price relative to the current share price and the predicted target price. I usually look at the performance of the stock over the last 3-6 months and pick a lower price somewhere along that spectrum. Finally I submit a "limit buy" order for the stock at my selected price, choosing the longest allowable term (up to 90 days for my discount broker, Scotia iTrade). Then we sit back and wait to see if the price hits. Note that my chosen price is a total guess and the stock may never fall that far, or may fall significantly more. But at very least, if the buy order executes, I will have purchased stock at a price much lower than when I placed the order and if all goes well, the price will eventually revert to that original level once the market re-stabilizes. This strategy worked extremely well recently. I put a $60 limit buy order for Premium Brand Holdings (PBH-T) when the share price was just over $64. I did not fully expect my price to hit but one day for no reason that I could ascertain, it did. The dip only lasted for a couple of hours and by the end of the day, the price had risen back to its original level and beyond. To this day, I still don't know what caused the stock to fall so dramatically for such a short period of time without any predictable event to point to as the cause. I'm glad that I had my bid in to take advantage of it or I would have missed it. In preparation for the results of the US election, I put in a couple of limit bids in the various accounts were I was able to accumulate cash. When the stock prices surprisingly rose after the election, I just left my bids in place awaiting the next event. 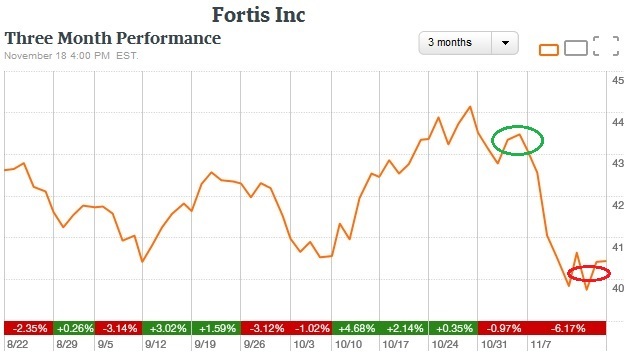 A few days later, my $40.40 limit buy order for Fortis (FTS-T) executed. The stock had fallen from almost $44 down to $39.58 before recovering a few days later at just over $40. As a result of the Trump victory and his intended inflationary policies, bond prices have fallen, driving up bond yields relative to stock yields. The Fortis stock succumbed to this pressure, falling over 5%. This time I did not successfully predict the "low", but I still picked up the stock at a relatively good price since the long term target price remains over $46. My limit buy bids in a couple of other stocks have not executed so far because these stocks have not fallen to my desired price. I will just leave the buy orders in play until they expire, in hopes of catching a price drop with the next event, or unless I happen notice a better opportunity. It is too bad that Scotia iTrade does not provide the term option to leave my order open until I decide to cancel it. So if I want my bid to continue beyond the 90 days, I need to remember to update my order to extend the date before it expires. The other issue I need to worry about on a limit buy bid is the partial fill of an order that is not completed by the end of the trading day. This occurs when there are not enough shares offered at my limit price to complete my order. For example, I recently tried to buy 102 shares of a stock but only 100 shares were available, leaving two shares unfilled. The next day, the final 2 shares were filled but because the trades occurred on two separate business days, I was charged the $9.99 commission on each day! This was pure carelessness on my part. I usually remember to cancel the remaining part of the order at the end of the day in order to avoid paying an extra commission on such a small purchase. This was a reminder to me to be more careful next time. As part of our banking strategy, we use President's Choice Financial (PCF) as our primary bank, since there are no service charges for deposits, withdrawals, writing or cashing cheques, bill payments and most other regular banking transactions, as well as no requirement to maintain a minimum balance in order to have fees waived. My one beef with PCF is that it still charges $1.50 for each Interac Email transfer, even though many other banks have reduced their fees to $1.00 or less. But looking closer at the chequing account offerings at each major bank, it became obvious that the lower (or free) Interac fees were more than offset by monthly fees or the need to maintain minimum balances. For example, Royal Bank advertised unlimited free Interac e-transfers on chequing accounts, but the cheapest account that I could find had monthly fees of $4.95 per month without any option to have the fees waived with a minimum balance. This fee negates the whole advantage of having free e-Transfers (which I don't use that often). It was a similar story with the other major banks. I noticed the advertising blitz for EQ Bank in the subway system and decided to check it out. EQ Bank is a CDIC-protected online bank with no physical branches that offers a Savings Plus account that provides free deposits, bill payments and electronic transfer to linked chequing accounts at other banks. In addition, the first five Interac e-Transfers per month are free ($1.50 after that). This more than satisfies my Interac needs. To sweeten the deal, the currently offered savings interest rate is 2%, calculated daily and paid monthly, one of the highest rates offered by any financial institution. Now I am not naive enough to think that this rate will be available forever. It is obviously a teaser rate meant to attract new members. But as long as EQ Bank maintains this rate, or at least one that is comparable to other institutions offering "high interest savings accounts", then I would be more than happy to use it as my new emergency fund savings repository. I have since opened an EQ Bank Savings Plus account and linked it to my PCF chequing account. I moved most of our emergency fund savings from my previous high interest savings account at Canadian Tire Bank (currently paying 1.3%) to EQ Bank. If EQ Bank eventually does significantly lower its interest rate, I can transfer surplus money back to Canadian Tire Bank, but I would still keep some in EQ Bank to take advantage of the 5 free Interac transactions per month. Given that accommodations make up one of the largest components of our travel expenses, we use home swapping as a means to reduce these costs, listing our condo on several home swap websites. We first dabbled in home swapping while we were still working, but could not take advantage of the full potential of this strategy until we retired and had the flexibility of time and schedule to devote to this. While we still had work obligations, we were extremely restricted in when and how long we could travel for. In spite of that, we were still able to arrange a 5 day exchange for an apartment across from Grant Park in Chicago, and a 10 day stay in a quaint flat with a small garden in the Montparnasse district of Paris. Having successfully completed 5 exchanges with plans for a 6th one this coming spring–an 11 day stay in a Venice apartment with a stunning view overlooking the Lagoona, we feel that we are now seasoned home swappers and can share some of our experiences. There are a growing number of home swap services out there, varying in price, features and depth of customer base. Just about all of them provide the same basic functions including the ability to set up home profiles with photos and descriptions of the home and the owners, a search facility to find potential homes to swap with, and a mechanism to communicate with prospective swap opportunities. Picking a home swap service seems akin to selecting a dating service–your potential matches are limited by the volume and quality of the candidates in the pool. And as with most things, you get what you pay for. The higher priced sites try to offer unique features to justify their additional costs. Location - search by country? province/state/county? city? neighbourhood within a city? We first decided to try home swapping by joining a free service called Geenee. While the price was certainly right, we found that most people who signed up were not serious about swapping and did not even bother to answer a swap request. 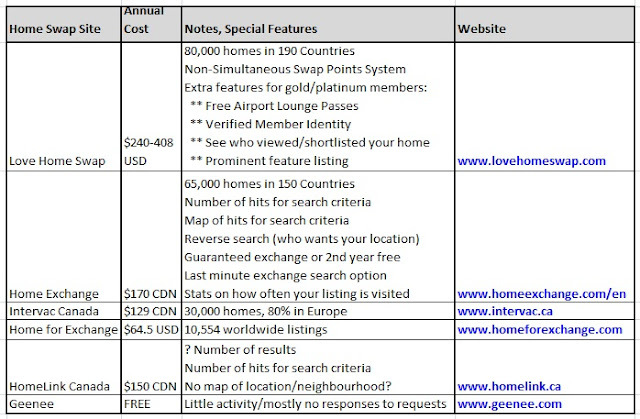 At the time that we retired in 2012, Love Home Swap was just getting started and offered a 30 day trial for $1. We ended up signing up with them and paid between $150-$170 CDN annually for the next 3 years. In the interim, Love Home Swap was growing through mergers and adding more features. Unfortunately as a result, their rates also increased dramatically. When it came time to renew at the end of 2015, we were shocked to find out that the fee for the next year would be $276 USD which came to $367 CDN. This is more than double the cost of the next most expensive site on our radar, which is Home Exchange at $170 CDN annually. This was also before the value of the Canadian dollar tanked, so the price differential would be even more now. So we are doing some evaluation this year to decide whether we should stay with Love Home Swap (where we have had much success) or switch to one of the less expensive services. If we do decide to switch, we have come to the conclusion that the best time to sign up for a new home swap service is at the beginning of the year and not at the end. Experience has taught us that most people do not start thinking about their annual vacations until the start of a new year, so why pay for a membership sooner than this. Most of the sites offer a free trial period of 2-4 weeks so we may try out a new exchange service prior to officially switching. Another tip is to design your home listing prior to signing up for the paid service or even for the trial period. You want to have your listed up and available for swaps as soon as possible so as not to waste time on your membership period. Most sites allow you to browse listings for free, so you can get some ideas of what an effective and appealing home listing looks like. 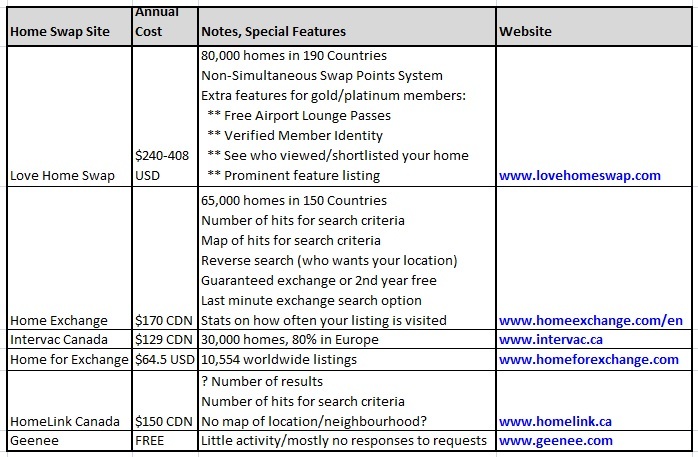 This is a sample of some of the details from our listing on Love Home Swap. When evaluating home swap options, we have learned to confirm the exact location of the home, as opposed to the location advertised in the listing. Otherwise we might end up in some suburbs far from the core of the city where we actually wanted to be. This is like saying we are in Toronto when we actually live in Mississauga or Burlington. We try to choose homes that are within a 25 minute walk or 20 minute transit to the tourist areas that we want to visit, with the transit itself being within a 5 minute walk from the home. By the same token, when deciding whether to join a home swap service, you need to realistically consider how appealing your location might be to a potential tourist. Generally downtown locations are preferred over suburban ones. If you do live in the boonies but also own a vacation property such as a lake-side cottage or a ski lodge, that could be a good swap option and would be even easier to get a match, since you could do non-simultaneous trades. Allowing someone to come stay in your home requires a degree of mutual trust. I think that there is a greater feeling of responsibility and consideration in a home swap than a rental. You always remember that while you are in someone's home, they are also in yours and you try to treat their home with the care and respect that you would like them to treat yours. Some services offer "contracts" that can be filled by both parties. I doubt that these are legally binding but at least they provide a common understanding of what is expected in the exchange. Security deposits or trip insurance are also offered for sale by some sites. So far, we have not found the need to adopt any of these extra measures. Instead we try to vet swap potentials based on their personal profiles, photos and descriptions of their home, as well as positive swap reviews. Being on a service that charges a non-nominal fee is itself an effective initial screening criteria. Once we agree on an exchange via email, we try to arrange a video Skype chat with our swap partners. This gives both parties an extra level of confidence since we can actually talk to each other "face to face", as well as getting a chance to "tour" each others' homes. By the time we actually swap with the other party, we usually no longer feel like we are interacting with strangers. Leaving a welcome gift such as wine, cheese, chocolate, etc. I also created a "Toronto Book" that describes the various places and events that might interest a tourist in Toronto including restaurants, shopping, art galleries, museums, farmers markets, parks, hiking trails, live theatre, sporting events, tourist attractions and annual festivals. For each attraction or event, I list the hours of operation, costs if any, address and how to walk or use transit to get there from our home. The house book and Toronto book were a lot of work to set up for our first swap, but once they were done, only minor tweaks have since been needed to keep the information up to date. Before leaving a home swap, we try to give it a good cleaning and tidying including doing all the dishes, tossing any perishables that we had purchased, tossing out the garbage and recycling, stripping the sheets off the bed and putting them into a laundry hamper along with the used towels, and putting new sheets on the bed if they have been provided for us. The same has been done by the people staying in our home and we occasionally come back to find our place cleaner than when we left it and wondering how they got our floors so shiny? Home swapping is not for everyone and it comes down to a matter of outlook. If your first thought is concern that strangers will be in your home, sleeping in your bed and touching your stuff, then home swapping is probably not for you. If instead you feel this is a chance to save money on travel, make new friends from around the world and have the opportunity to live like locals in a foreign location, then you are well suited for this endeavour.